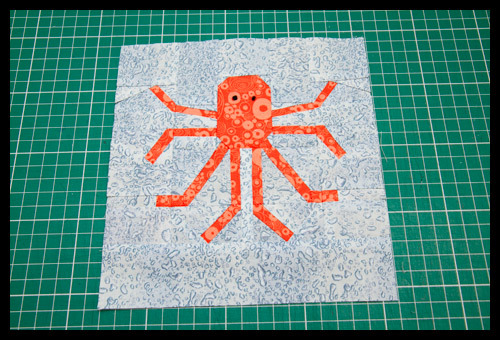 The paper pieced octopus for this month’s Piece Bee With You mama Lynne. She wanted, and I quote, ‘aquatic organisms’ (so that would be sealife to the rest of us ;o) ). Someone else had already claimed a jellyfish, and a flock of goldfish had sprung up (do goldfish do shoals? That just seems odd somehow) Anyway, so I claimed the octopus before anyone else got in there (although at just over 60 pieces, perhaps there was a reason no-one else had rushed there :oD ). I have to admit now that I made the eyes French knots, piecing them in might have given me a healthy shove over the edge (and I’m really not healthy right now as I have tonsillitis and the offending parts feel about the size of golfballs :o/ ) Still, I was proud of my fabric finds, they both seemed to work really well for the pertinent parts. He’s about 7 1/2″ x 7 3/4″, and I hope I’ve left enough of the requisite space around for her to play with if needed. i love him!!! i didn't pick octopus for that very reason- many many pieces were inevitable. I agree you are mad, 60 pieces and tonsilitis to boot! Looks wonderful though, so maybe mad is good 🙂 Enjoy your weekend. Cute and again cute. Hope you're feeling better soon. Hugs! Mr. Arms (giggle) is great. Really, 60 pieces? Good grief. What an awesome block! I'm totally scared of paper piecing – and 60 pieces is pretty full on. Can't believe you did it while sick! Hope you're better soon. This is so darn cute! Thanks for sharing! You are definitely the PP Queen now – 60 pieces, OMG. What a cute octopus! Feel better soon! Look at that little cutie! oh my god! i am bowing, seriously, bowing to you right now!! !